Calculation for inter-rater reliability where raters don't overlap and different number per candidate? I want to calculate the degree to which the gymnastics judges agree on balance beam scores, i.e., "inter-rater reliability". However, not all judges judge the same candidates, and the number of judges per candidate also varies. There are around 30 judges making roughly 1500 observations. Can you please tell me how to do this statistically, perhaps using Cronbach's alpha? STATA set-up advice would help, as well. Here's an example using the kappa-statistic measure of interrater agreement. 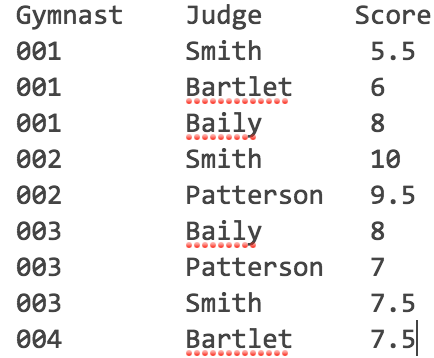 Before proceeding, we will need to reshape the data so that each row is a gymnast but each score variable corresponds to single judge. Not the answer you're looking for? Browse other questions tagged stata reliability agreement-statistics or ask your own question. How to perform inter-rater reliability with multiple raters, different raters per participant, and possible changes over time? How to calculate inter-rater reliability with multiple raters and multiple categories per item? Inter-rater Reliability (Krippendorf's Alpha) for raters of a single observed unit?